Not quite the storm of the decade, Dry Creek peaked at 1,390 cfs early yesterday morning. As of this morning, accumulated rainfall since the first of the year on lower Dry Creek has been a little over 4 inches, with yet another storm forecast to bring about 1.5″ due midday tomorrow—all welcome. The continual gray clouds and rain of late seems miraculous when contrasted with the bare hills and dust of the past four years that have been permanently imprinted in our minds as more normal than not. The drought changed our thought processes and how we operate the ranch. And despite the ample availability of water streaming in nearly every canyon, I have often caught myself still worrying about stockwater. It’s how we lived, day to day, for a long time. It’s good to see the creek running, the literal lifeblood of the canyon, a psychological lift as we inhale the moist air and relax a little before addressing the work that waits ahead of us. We have calves to brand and watergaps to fix as soon as we can physically get to them, when the roads dry out and creek goes down, which probably won’t be until next week if tomorrow’s storm materializes. 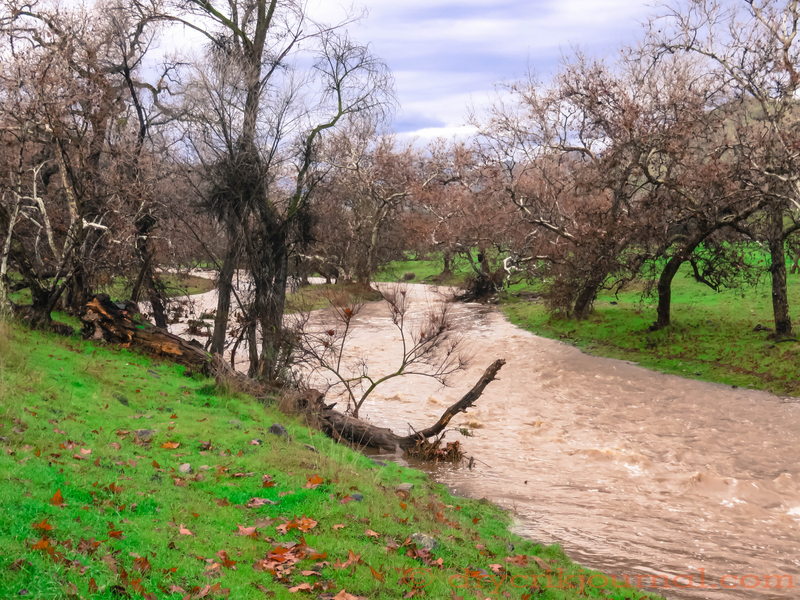 This entry was posted in Photographs, Ranch Journal and tagged Drought, Dry Creek, photography, rain, water, weather. Bookmark the permalink. If we don’t wash away we can look forward to next Fri, Sat & Sun. The sun should be out and we will have a chance to straighten out what the water did. Water is truly the lifeblood of the land. Frogs are singing and grass is growing!! I rejoice every time I read one of you posts about rain or moisture in any form, John. Hurray! Answered prayers. Heading “home” for a visit in April. I can’t wait to see the green and flowers. I bet you’re looking forward to playing in the mud rather than playing in the dust.